MSME-DI Nagpur in association with MIDC Industries Association, Ready-made Garment Cluster, Nagpur Rice Millers Association, Ramtek, Alliance for Indian MSME and Nagpur Agarbatti Cluster Association (NACA) recently organised two-day interactive workshop on ‘Intellectual Property Rights (IPR)’. Dinesh Rai, former Secretary, Government of India graced the occasion as chief guest. P M Parlewar, Director, MSME-DI, Nagpur, Sandip Bharne, President of Nagpur Agarbatti Cluster, B C Bhartia, National President of Confederation of All India Traders (CAIT), Capt. C M Randhir, President of MIA, Pankaj Borkar, Deputy Controller of Patent, V Shivaji, Director of Rice Mill Association, Ramtek were seated on the dais. Speaking on the occasion, Dinesh Rai said, “There is need to organise programmes on IPR to create awareness about IPR amongst MSMEs of Vidarbha.” He said, “Nowadays patent/trademark is very valuable. Hence, IPR must figure high on India’s development agenda. In order to make Indian economy knowledge based and to build up India’s international competitiveness more on the basis of knowledge than on the basis of cheap labour and raw materials, it is imperative for Indian people to encourage and protect its IP.” He said, IP rights protect all the aspects of the business, its name and logo, designs, inventions, works of creative or intellectual effort or trademarks that distinguish the business. The Intellectual Property Rights were essentially recognised and accepted all over the world due to important reasons like to provide incentive to the individuals for new creations, providing due recognition to the creators and inventors, ensuring material reward for intellectual property and ensuring the availability of the genuine and original products. He appealed to all the participants to avail maximum benefit from the programme. P M Parlewar said, an effective and enabling administrative and legal regime for IPR bestows confidence to the IP-owner and creator allowing them to manage and eventually create the crucial link between innovation and its economic applications. B C Bhartia said, “The workshop is beneficial for the growth of MSMEs and it will promote prospective and existing entrepreneurs. Innovations are much needed and for this purpose there is a need to change the mindset. It will be better, if we first innovate in India and then manufacture in India. IPR protects the identity of products manufactured by MSMEs.”. Capt. C M Randhir said, “MSME is taking lead in arranging such workshops for MSEs which are very much needed. 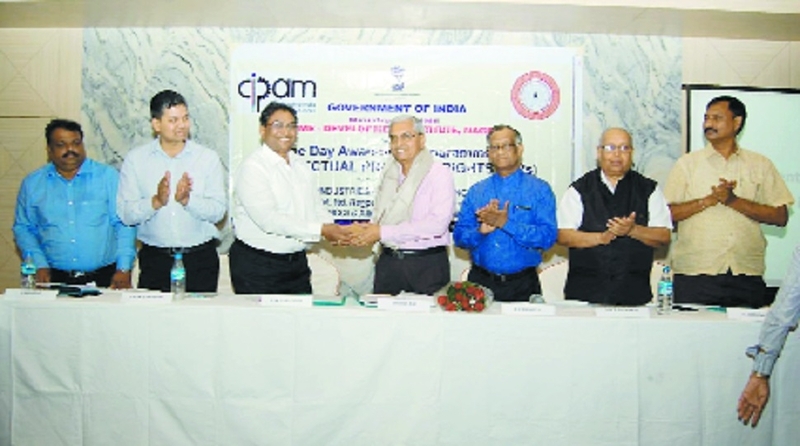 But there is lack of awareness in our country about patents and IPR and for this purpose investment in R&D is needed.” In his address, Pankaj Borkar thanked MSME-DI Nagpur for organising programme on IPR which will definitely create awareness amongst the entrepreneurs and help in growth of MSMEs. He gave power point presentation on topics like introduction to IPR, trademark, industrial design, copyright, geographical indication, trade secret, national and international IP laws, etc. The programme was co-ordinated by M V K Jha of MSME-DI Nagpur who also proposed vote of thanks.